Acclaimed British coach Mike Spracklen plans to revive Russia’s Soviet-era rowing glory. The Russian Rowing Federation has signed a contract with acclaimed British coach Mike Spracklen, who will train the Russian eight for the 2016 Olympics in Rio de Janeiro. The 75-year-old legend is challenged with reviving Russia’s Soviet-era rowing glory. 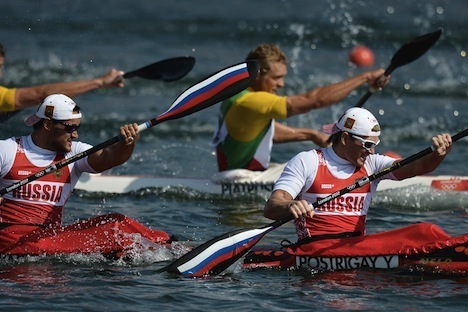 The last time Russian rowers won Olympic medals was in Athens, back in 2004. They failed, however, to make it into the finals in any event during the recent games in Beijing and London. “The world’s leading coaches have been shocked by the results of the Russian national team in the last few years,” British coach Mike Spracklen says. President of the Russian Rowing Federation, Veniamin Boot, said the situation obviously had to be changed completely. Enter Spracklen – a true coaching legend. He first coached at the Montreal Olympics in 1976, where he led the Great Britain double scull to silver. In 1984, he coached the British coxed four to victory at the Los Angeles Olympics. It was the first gold for team Great Britain since 1948. Four year later, Great Britain won the gold again – this time in Seoul. That winning team included Steve Redgrave, who went on to win four more Olympic gold medals. Spracklen has also coached U.S. and Canadian teams. He won with the American rowers at the 1994 World Championships and with the Canadians at the 1992 and 2008 Olympics. The Canadian men’s eight came second at the London Olympics in 2012. “This is a new challenge for me, and I took it on only because I saw that Russia wanted to revive the Soviet traditions for real. Without this will, it will be impossible to create the pyramid. I only need to share my experience and guide the athletes in the right direction,” says Spracklen. Russian sports have recently engaged many prominent foreign coaches. The results have mostly been positive. Russia won the bronze at the 2008 UEFA European Football Championship, led by Guus Hiddink. David Blatt led the Russian men’s basketball team to bronze medals in London. Last, but not least, the Russian judo team, led by Ezio Gamba, produced a sensation in London, winning three gold medals.